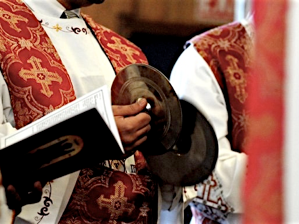 Under the auspices of Their Graces Bishop Serapion, Bishop Youssef, Bishop David, Bishop Mina, and others, a committee of deacons was formed to research and record standardized congregational responses for the Liturgy of St. Basil. The purpose of these standard responses is to unify congregational responses throughout North America and make it easier for visitors to pray in any parish. The files below reflect the fruit of the committee’s efforts. Our fathers the hierarchs have requested that the deacons and congregation in every parish review these responses and offer their feedback before making them official. Please find links to both play and download the files below. In addition, there is a feedback form at the end of this post that can be used to send your comments directly to the persons responsible for this wonderful effort.